Sir David Attenborough is one of the world’s most acclaimed broadcasters and naturalists. A pioneer of nature documentaries and for over 50 years the highly respected face and voice of natural history programmes broadcasted all over the world. His series have been highly influential in raising both our appreciation of the natural world and our awareness of the environmental crisis threatening it. Recipient of many honours and awards, he has one extinct and one extant species named after him, Attenborosaurus conybeari and Zaglossus attenboroughi. Born in Belfast, she received a B.Sc. from Glasgow and went on to do a Ph.D. in Cambridge with Anthony Hewish. Working on her Ph.D. in 1968 she discovered the first four radio pulsars or rapidly rotating neutron stars. When her supervisor was awarded the nobel prize for this discovery in 1974, she was not included. Burnell held a variety of university posts before being appointed Professor of Physics at the Open University in 1991. She was also a visiting professor at Princeton. Burnell was Dean of Science at the University of Bath between 2001 and 2004, and was President of the Royal Astronomical Society between 2002 and 2004. She is currently Visiting Professor of Astrophysics at the University of Oxford and has been elected President of the Institute of Physics for 2008-09. Burnell has won many scientific awards and has been awarded numerous honorary degrees, most recently from Harvard and Durham. In 1999 she received a CBE and in 2007 a DBE. Burnell describes herself as "a role model, a spokeswoman, a representative, and a promoter of women in science in the U.K."
Ann Dowling is Professor of Mechanical Engineering at the University of Cambridge, Director of the University Gas Turbine Partnership with Rolls-Royce, and Head of the Division in which research in aeronautics and energy is carried out at Cambridge. She has held visiting posts at MIT and at Caltech. Ann Dowling works primarily in the fields of combustion, acoustics and vibration and her research is aimed, in particular, at low-emission combustion and quiet vehicles. She is the UK lead of the Silent Aircraft Initiative, a collaboration between researchers at Cambridge and MIT who have released the conceptual design of an ultra-low noise and fuel efficient aircraft. Ann Dowling is a Fellow of the Royal Society, Royal Academy of Engineering and is a Foreign Associate Member of the US National Academy of Engineering and of the French Academy of Sciences. She serves on a number industry and government advisory committees, and chaired the EPSRC Technical Opportunities Panel (2003-06) and the Royal Society/Royal Academy of Engineering study on nanotechnology. She was appointed CBE for services to Mechanical Engineering in 2002 and DBE for services to Science in 2007. David P. Farrington is Professor of Psychological Criminology at the University of Cambridge and Director of the Cambridge Study of Delinquent Development, a 40 years longitudinal study of criminal careers. He is a leading authority on crime prevention and has authored over 15 books in the areas of comparative criminology, bullying, developmental prevention and the impact of criminological interventions. His research has considerable impact on policy making internationally. He was President of the American Society of Criminology, of the European Association of Psychology and Law and of the British Society of Criminology. He is an OBE, a fellow of the UK Academy of Medical Sciences and the British Academy. One of the best known and most important satirists in the English language today, he is often compared to Jonathan Swift. He is the author of the famous Discworld series of 36 books (four of which are written for children), in which he created a satirical counter world to hold up a distorting mirror to our own. His work has sold more than 55 million copies worldwide and has been translated into 33 languages. He has won numerous literary awards and was made an OBE in 1998. In 2007 Terry Pratchett was diagnosed with a rare early onset Alzheimer’s disease. Since then he has been generously supporting research on Alzheimer’s disease and has spoken out publicly about his illness, confronting the taboo around the disease and encouraging an open debate. Janet Browne is currently Aramont Professor of the History of Science at Harvard University. A zoology graduate of the College, she is the world's leading scholar on the life, times, and thought of Charles Darwin, and her two-volume Darwin biography has won wide acclaim. While framed as a biographical study, it explores the ways in which scientific knowledge is created, distributed and accepted. It has won many literary and scholarly prizes. Before coming to Harvard in 2006, she taught history of science, biology and medicine at the Wellcome Trust Centre for the History of Medicine at UCL. She is associate editor of the early volumes of The Correspondence of Charles Darwin (14 vols), and has been editor of the British Journal for the History of Science and President of the British Society for the History of Science. Born in Co. Antrim and a graduate of QUB, Mr Dunbar for decades has been the doyen of children’s literature in Ireland. 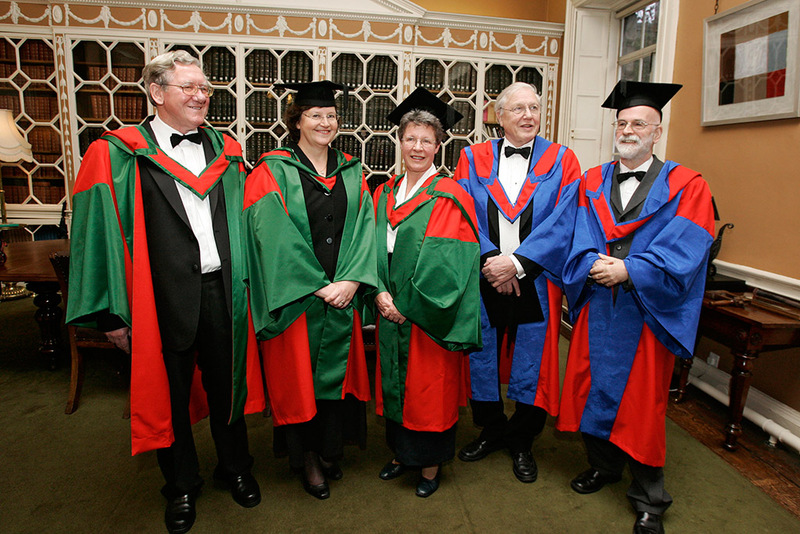 He has been a key figure for the establishment of children’s literature as an academic subject in Ireland and beyond. He has been the public face and voice of the study of children’s literature on television, radio and in the newspapers. Founding member of the Children’s Literature Association of Ireland and its President for two years. 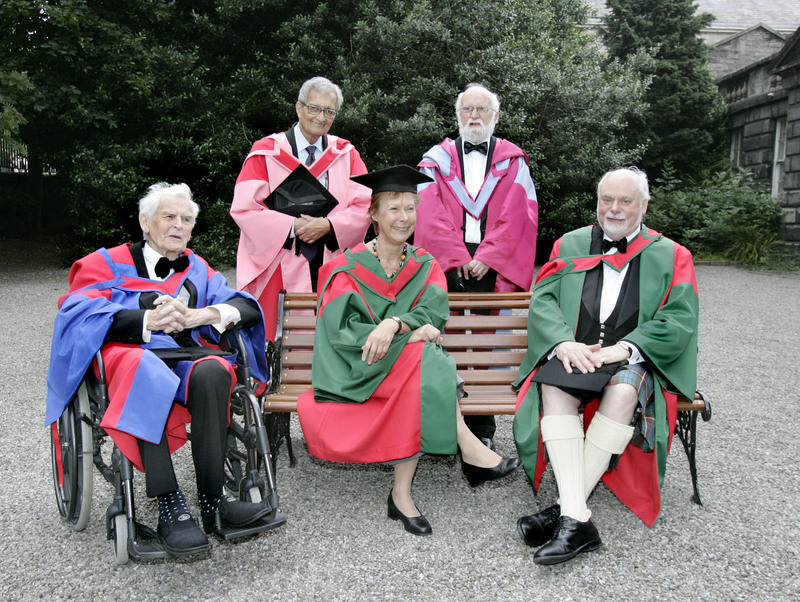 Most of his teaching career was with one of TCD’s associated colleges, the Church of Ireland College of Education, where he taught for over 25 years; he also lectured for many years on TCD’s B.Ed programme. Born in 1921 in Co. Cork, Patrick Scott has been one of the most successful and influential Irish visual artists of the 20th century and is honoured in recognition of his life-long contribution to the arts in Ireland. As the foremost modernist in Irish art, he was central to bringing modernism to Ireland. His paintings have been displayed in exhibitions all over the world from New York to Baghdad, from Stockholm to Rijeka. He won a Guggenheim award in 1960 and represented Ireland at the Biennale that year. He is a member of Aosdana. In 1981 he had a major retrospective in the Douglas Hyde Gallery, and the tapestry in the foyer of the Berkeley Library is by Patrick Scott. Outstanding Indian economist and global public intellectual, he was Nobel Prize winner in Economics in 1998 (specifically for work on famine theory). Sen, currently a Harvard chairholder, was formerly Master of Trinity College Cambridge, and quondam professor in the Delhi School of Economics. His most recent books include Development as freedom, The argumentative Indian, and Identity and violence: The illusion of destiny. One of the world’s leading and most influential nanoscientists. Born in 1942 in Scotland, Professor Stoddart is Acting Director of the California NanoSystems Institute (CNSI) and Fred Kavli Chair of NanoSystems Sciences at UCLA. He is a pioneer in the use of molecular and ion recognition and one of the few living chemists who have created a new field of Chemistry. He has been a strong supporter of the development of Nanoscience in Ireland and has had firm links with TCD for many years, last giving a plenary paper in the College in 1999. He was made a Fellow of the Royal Society in 1994 and of the German Academy of Natural Sciences in 1999. He received a knighthood from Queen Elizabeth II in 2006.